Biotechnology is the use of artificial methods to modify the genetic material of living organisms or cells to produce novel compounds or to perform new functions. Biotechnology has been used for improving livestock and crops since the beginning of agriculture through selective breeding. Since the discovery of the structure of DNA in 1953, and particularly since the development of tools and methods to manipulate DNA in the 1970s, biotechnology has become synonymous with the manipulation of organisms’ DNA at the molecular level. The primary applications of this technology are in medicine (for the production of vaccines and antibiotics) and in agriculture (for the genetic modification of crops). Biotechnology also has many industrial applications, such as fermentation, the treatment of oil spills, and the production of biofuels, as well as many household applications such as the use of enzymes in laundry detergent. To accomplish the applications described above, biotechnologists must be able to extract, manipulate, and analyze nucleic acids. To understand the basic techniques used to work with nucleic acids, remember that nucleic acids are macromolecules made of nucleotides (a sugar, a phosphate, and a nitrogenous base). The phosphate groups on these molecules each have a net negative charge. An entire set of DNA molecules in the nucleus of eukaryotic organisms is called the genome. DNA has two complementary strands linked by hydrogen bonds between the paired bases. Unlike DNA in eukaryotic cells, RNA molecules leave the nucleus. Messenger RNA (mRNA) is analyzed most frequently because it represents the protein-coding genes that are being expressed in the cell. To study or manipulate nucleic acids, the DNA must first be extracted from cells. 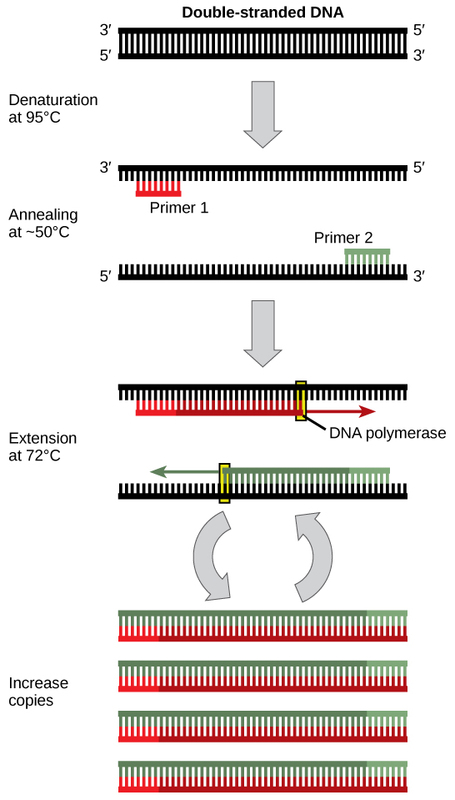 Various techniques are used to extract different types of DNA (Figure 10.2). Most nucleic acid extraction techniques involve steps to break open the cell, and then the use of enzymatic reactions to destroy all undesired macromolecules. Cells are broken open using a detergent solution containing buffering compounds. To prevent degradation and contamination, macromolecules such as proteins and RNA are inactivated using enzymes. The DNA is then brought out of solution using alcohol. The resulting DNA, because it is made up of long polymers, forms a gelatinous mass. Figure 10.2 This diagram shows the basic method used for the extraction of DNA. RNA is studied to understand gene expression patterns in cells. RNA is naturally very unstable because enzymes that break down RNA are commonly present in nature. Some are even secreted by our own skin and are very difficult to inactivate. 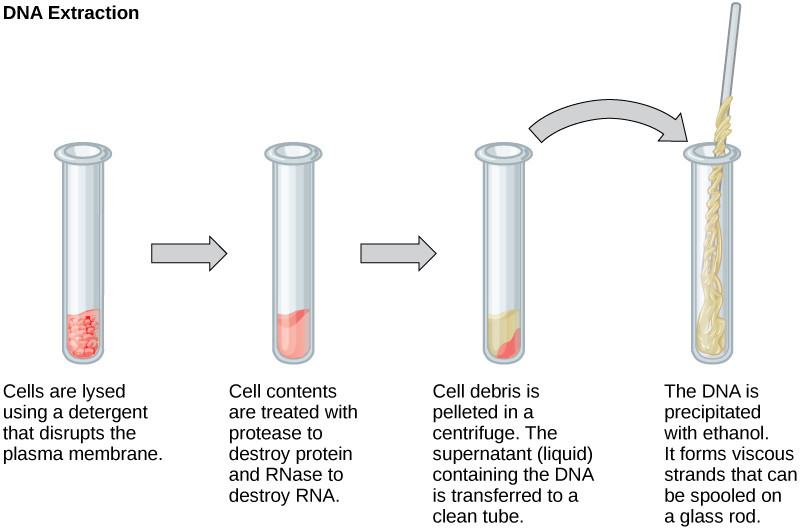 Similar to DNA extraction, RNA extraction involves the use of various buffers and enzymes to inactivate other macromolecules and preserve only the RNA. Because nucleic acids are negatively charged ions at neutral or alkaline pH in an aqueous environment, they can be moved by an electric field. Gel electrophoresis is a technique used to separate charged molecules on the basis of size and charge. The nucleic acids can be separated as whole chromosomes or as fragments. The nucleic acids are loaded into a slot at one end of a gel matrix, an electric current is applied, and negatively charged molecules are pulled toward the opposite end of the gel (the end with the positive electrode). Smaller molecules move through the pores in the gel faster than larger molecules; this difference in the rate of migration separates the fragments on the basis of size. The nucleic acids in a gel matrix are invisible until they are stained with a compound that allows them to be seen, such as a dye. Distinct fragments of nucleic acids appear as bands at specific distances from the top of the gel (the negative electrode end) that are based on their size (Figure 10.3). 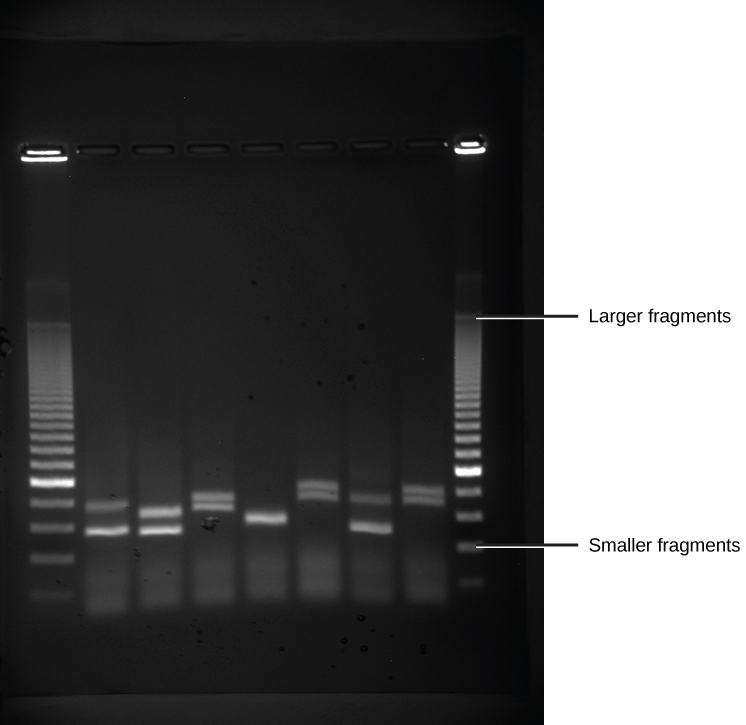 A mixture of many fragments of varying sizes appear as a long smear, whereas uncut genomic DNA is usually too large to run through the gel and forms a single large band at the top of the gel. DNA analysis often requires focusing on one or more specific regions of the genome. It also frequently involves situations in which only one or a few copies of a DNA molecule are available for further analysis. These amounts are insufficient for most procedures, such as gel electrophoresis. Polymerase chain reaction (PCR) is a technique used to rapidly increase the number of copies of specific regions of DNA for further analyses (Figure 10.4). PCR uses a special form of DNA polymerase, the enzyme that replicates DNA, and other short nucleotide sequences called primers that base pair to a specific portion of the DNA being replicated. PCR is used for many purposes in laboratories. These include: 1) the identification of the owner of a DNA sample left at a crime scene; 2) paternity analysis; 3) the comparison of small amounts of ancient DNA with modern organisms; and 4) determining the sequence of nucleotides in a specific region. Figure 10.4 Polymerase chain reaction, or PCR, is used to produce many copies of a specific sequence of DNA using a special form of DNA polymerase. Figure showing PCR in 4 steps. First, the double strand of DNA is denatured at 95 degrees Celsius to separate the strands. The 2 strands are then annealed at approximately 50 degrees Celsius using primers. DNA polymerase then extends the new strands at 72 degrees Celsius. The fourth step shows that this procedure takes place many times, resulting in an increase in copies of the original DNA. Figure 10.5 In this (a) six-nucleotide restriction enzyme recognition site, notice that the sequence of six nucleotides reads the same in the 5′ to 3′ direction on one strand as it does in the 5′ to 3′ direction on the complementary strand. This is known as a palindrome. (b) The restriction enzyme makes breaks in the DNA strands, and (c) the cut in the DNA results in “sticky ends”. Another piece of DNA cut on either end by the same restriction enzyme could attach to these sticky ends and be inserted into the gap made by this cut. Because these overhangs are capable of coming back together by hydrogen bonding with complementary overhangs on a piece of DNA cut with the same restriction enzyme, these are called “sticky ends.” The process of forming hydrogen bonds between complementary sequences on single strands to form double-stranded DNA is called annealing. Addition of an enzyme called DNA ligase, which takes part in DNA replication in cells, permanently joins the DNA fragments when the sticky ends come together. In this way, any DNA fragment can be spliced between the two ends of a plasmid DNA that has been cut with the same restriction enzyme (Figure 10.6). Figure 10.6 This diagram shows the steps involved in molecular cloning. Figure 10.7 Dolly the sheep was the first agricultural animal to be cloned. To create Dolly, the nucleus was removed from a donor egg cell. The enucleated egg was placed next to the other cell, then they were shocked to fuse. They were shocked again to start division. The cells were allowed to divide for several days until an early embryonic stage was reached, before being implanted in a surrogate mother. Why was Dolly a Finn-Dorset and not a Scottish Blackface sheep? Because even though the original cell came from a Scottish Blackface sheep and the surrogate mother was a Scottish Blackface, the DNA came from a Finn-Dorset. Watch this short video explaining how scientists create a transgenic animal. Nucleic acids can be isolated from cells for the purposes of further analysis by breaking open the cells and enzymatically destroying all other major macromolecules. Fragmented or whole chromosomes can be separated on the basis of size by gel electrophoresis. Short stretches of DNA can be amplified by PCR. DNA can be cut (and subsequently re-spliced together) using restriction enzymes. The molecular and cellular techniques of biotechnology allow researchers to genetically engineer organisms, modifying them to achieve desirable traits. Cloning may involve cloning small DNA fragments (molecular cloning), or cloning entire organisms (reproductive cloning). 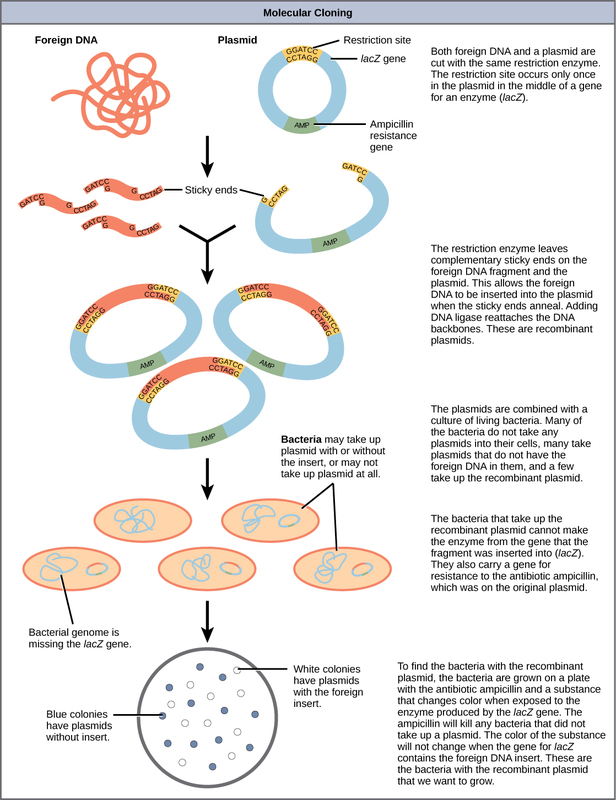 In molecular cloning with bacteria, a desired DNA fragment is inserted into a bacterial plasmid using restriction enzymes and the plasmid is taken up by a bacterium, which will then express the foreign DNA. Using other techniques, foreign genes can be inserted into eukaryotic organisms. In each case, the organisms are called transgenic organisms. 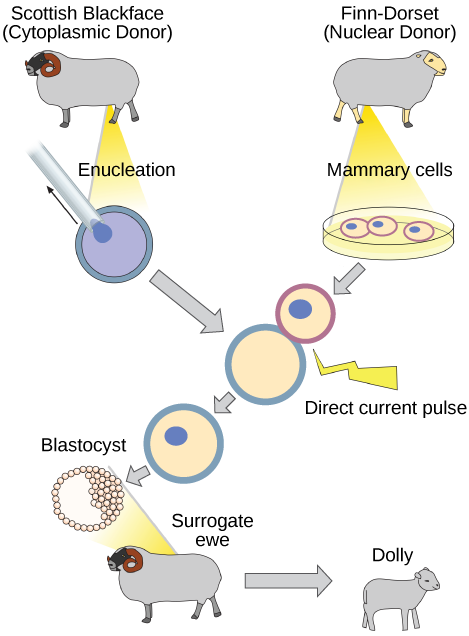 In reproductive cloning, a donor nucleus is put into an enucleated egg cell, which is then stimulated to divide and develop into an organism. In reverse genetics methods, a gene is mutated or removed in some way to identify its effect on the phenotype of the whole organism as a way to determine its function. Answer: Because even though the original cell came from a Scottish Blackface sheep and the surrogate mother was a Scottish Blackface, the DNA came from a Finn-Dorset. In gel electrophoresis of DNA, the different bands in the final gel form because the DNA molecules ________. In the reproductive cloning of an animal, the genome of the cloned individual comes from ________. What carries a gene from one organism into a bacteria cell? What is the purpose and benefit of the polymerase chain reaction? The polymerase chain reaction is used to quickly produce many copies of a specific segment of DNA when only one or a very few copies are originally present. The benefit of PCR is that there are many instances in which we would like to know something about a sample of DNA when only very small amounts are available. PCR allows us to increase the number of DNA molecules so that other tests, such as sequencing, can be performed with it. 10.1 Cloning and Genetic Engineering Copyright © by laesoph. All Rights Reserved.